You can help start a revival in your town! If you have read Revolution in World Missions and No Longer A Slumdog, you can request copies to share them with your friends and family. Simply give out free copies of Revolution in World Missions, the book that has impacted thousands of hearts—including yours! Your friends and family will be challenged to walk closer to Jesus, and you will have a huge part in inspiring others to help reach the lost in Asia for Christ. I just finished reading Revolution in World Missions, and it has literally changed my life. This book changed my outlook on life and broke my heart for the need of sharing the Gospel around the world. Fill out the form (log in required) and we will send you five free books to hand out to your friends, family, pastor and church members! All you have to do is give out the books and send us the names and contact information of the people who received them. When you need five more, just let us know! 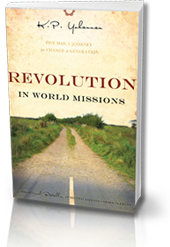 If you have not read this book yet, order a free copy of Revolution In World Missions. After a month or so on my book shelf, I finally read it, and true to it's name, it has totally revamped not only how I feel about missions, but how I feel about church & tithing in general. This is a new and exciting perspective. Tell others about the hope Christ is bringing to desperate children in South Asia! There are two practical ways you can spread the message. Those with no voice—the suffering children of Asia—tell their stories. And as you listen to them, you share their anguish and rejoice in their triumphs. The whole world seems to stop as you look on. A new day is dawning in some of the darkest corners of the world. 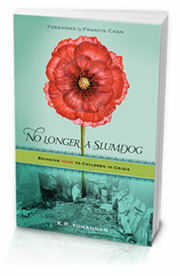 If you have not read this book yet, order a free copy of No Longer A Slumdog. Hearing an analysis of North American Christianity from a two-thirds world perspective really struck me. God used that to stir my heart, showing me that no matter where we live in this world, all Christians must apply themselves to the selfless expectations of the Gospel of Christ. Thank you for your book. I will be passing it on to my friends and family.